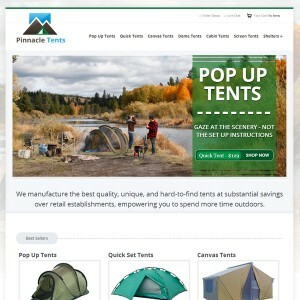 We just went live with our newly redesigned consumer camping tent website http://www.camptents.com . Drop by and add to the discussion and share any camping tips and stories you have. We will also now be hosting our blog on our site http://www.camptents.com/blog/ so we encourage you to visit and add to the discussion, since that will be the most up to date blog. We couldn't transfer all of our reviews to our new camping tent site so we encourage our customers both old and new alike to share their experiences with our tents and service. Are you still in business selling tents to customers versus in bulk? If so - are the canvas cabin tents (646 or 647) still available? If they are out of stock, when will they be back in stock? We are still catching up on manufacturing all our canvas tent backorders received from our commercial customers. We will have more canvas tents in stock and in our warehouse for consumer sales by January of 2017.